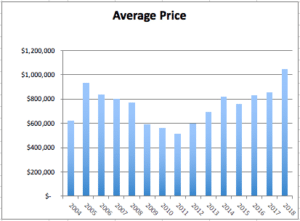 In 2018, real estate in the Tahoe Truckee region capped a bull market streak dating back to Spring, 2011 with highest ever annual figures for total dollar volume, average price and quantity of transaction above $1 million and $10 million. Inspired by a record number of premium transactions, the region totaled just under $1,700,000,000 in real estate sales, a number greater than any single year in history. 386 transactions exceeded $1 million a record for both the total quantity and, at 23%, the share of all sales in the region. 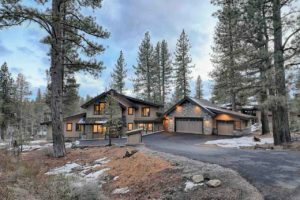 At the market’s highest reaches, 7 properties generated eight-digit sums including 4 different properties on Tahoe’s West Shore that traded above $20,000,000. These exceptional properties delivered the first ever annualized average price of over $1,000,000. This 22% increase is moderated by a 7.5% gain in median price, more reflective of the performance of real estate across all classes. While reaching new heights, the market clearly reached a saturation point showing an 8% regression in the total number of units sold. While this slowing was undoubtedly attributable to a shortage of inventory; particularly in entry-level price points; early in the year, inventory has stabilized slightly to 4 months’ supply. While this figure is higher than at the start of 2018, it is the second lowest supply available to start a year on record. Attempting to normalize 2018 results absent lakefront and other premium property sales reveals a more sustainable environment with certain communities showing gains: Martis Camp, Lahontan, Old Greenwood, and Northstar. While other communities including, Gray’s Crossing and Tahoe Donner, maintained gains realized in previous years. To expect such results to continue would be disingenuous. As stated above, the total number of transactions have moderated while available supply has crept upward. Some measure of cooling would ultimately be healthy for a market wherein appreciation has outpaced inflation and other core metrics for a prolonged period. Unlike a decade ago, there is neither the rampant speculation nor egregious debt that had a spiraling effect. In fact, certain conditions now exist that may safeguard against a meaningful backslide including tremendous demand for nightly rentals that offer a meaningful offset to carry costs. Even the Great Recession did not dim the desire for Northern Californians to spend time in the mountains keeping transient demand healthy. Even the slightest deceleration in the market could cool runaway construction costs; a condition that has dampened land values and restrained creation of new product below the market’s premium reaches. In a market starved for new, highly-amenitized sub-premium homes, this could have a stimulating effect that benefits consumers in all price points. As innovation fuels wealth creation in Silicon Valley and throughout Northern California, easily accessible second homes will always have value. As has always been the case, Tahoe will continue to be the Sierra playground for generations to come.